I'm back with the Sindie POP! 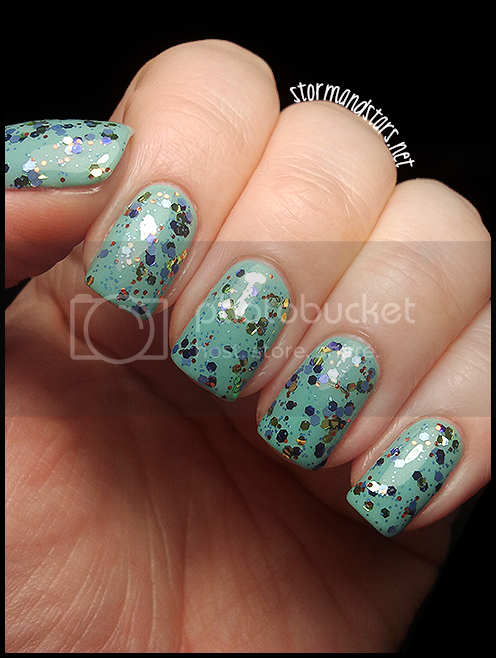 Lacquer Scooby Doo! Collection. :) This collection is Limited Edition and is available starting today! I didn't really watch Scooby Doo growing up (I was a scaredy cat, honestly) but my girlfriend absolutely LOVES Scooby Doo so I was really excited to get this collection. Even though I didn't watch the show, I know all the characters and these glitters really do a great job of capturing each character. Lets get right to the swatches shall we? 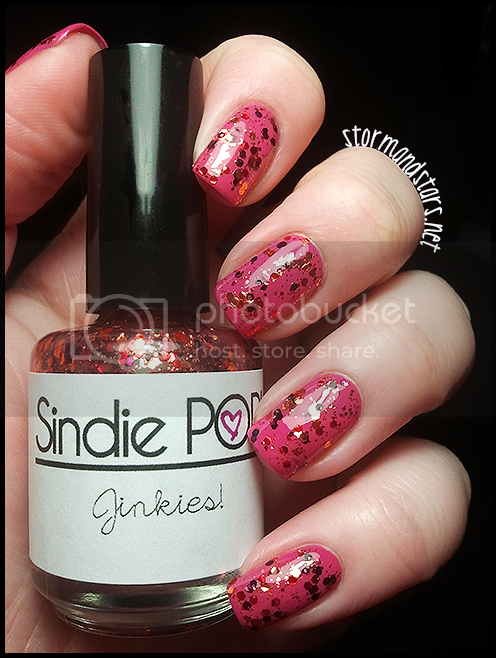 Up first is the glitter based on Velma. The few times I watched the show, Velma was always my favorite. She reminds me the most of myself. This glitter is so pretty. The colors are all from Velma's clothing in maroon and burnt orange and golds. By itself the colors look like fall leaves. 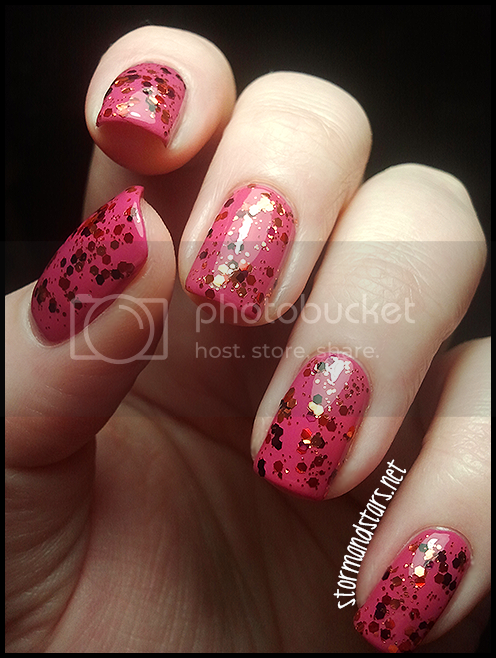 I'll definitely be doing some type of fall manicure with this one next autumn. 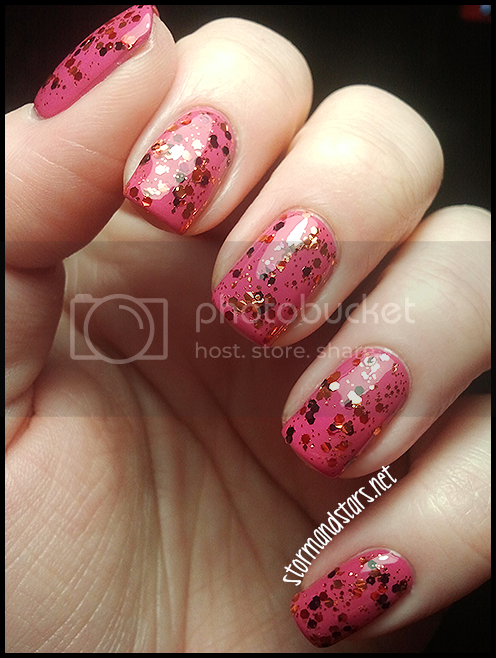 I started out with two coats of my favorite pink for the underwear on this, Ultimate Pink by Essence. I need to pick up a couple more bottles. I added one coat of Jinkies! over Ultimate Pink. 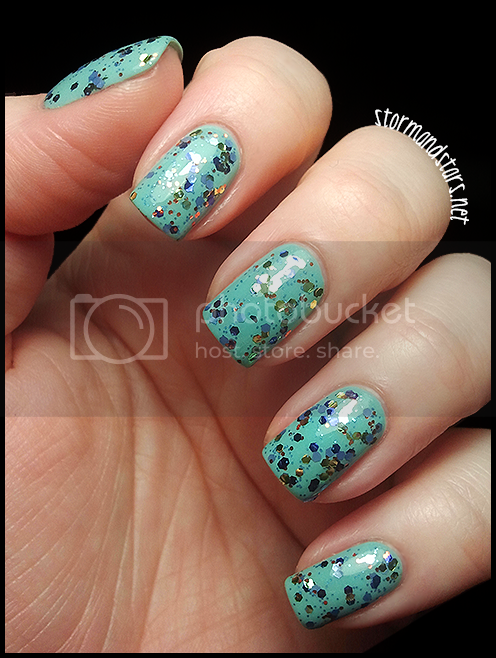 This is jam packed with glitter so I had some clumping of glitter, but i just used the brush to even it out on the nail with no problems at all. 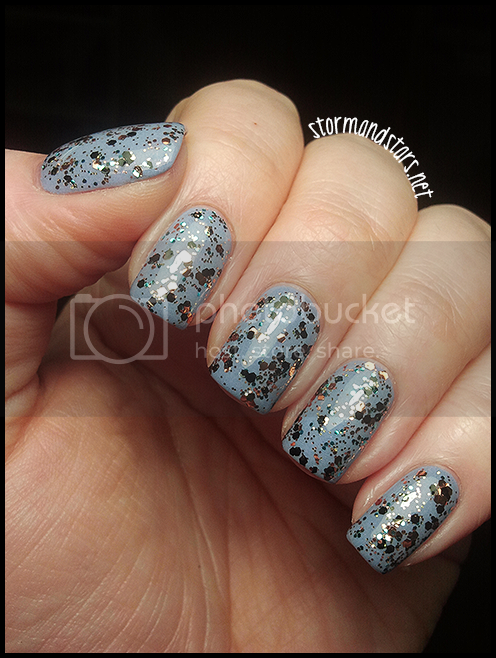 Bronze/brown and black glitter make up the majority of this shade with tiny teal blue hexes thrown in to represent Scooby's collar. I love that attention to detail in these. 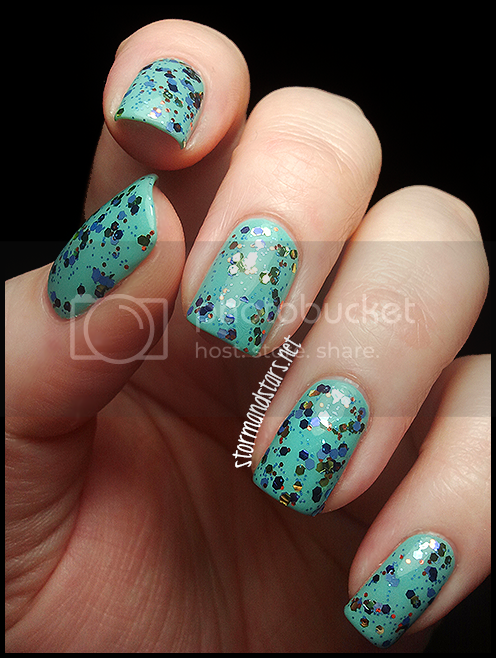 I used two coats of Essence A Lovely Secret as the base for this super sparkly shade. I love the little flashes of the blue when I turn my hand in the light. Jessica did a wonderful job capturing Scooby in the colors here. 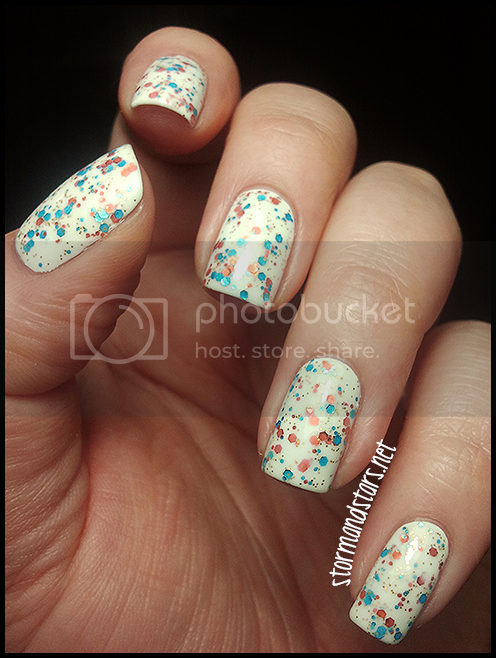 The polish based on Fred is the only glitter here without a clear base. 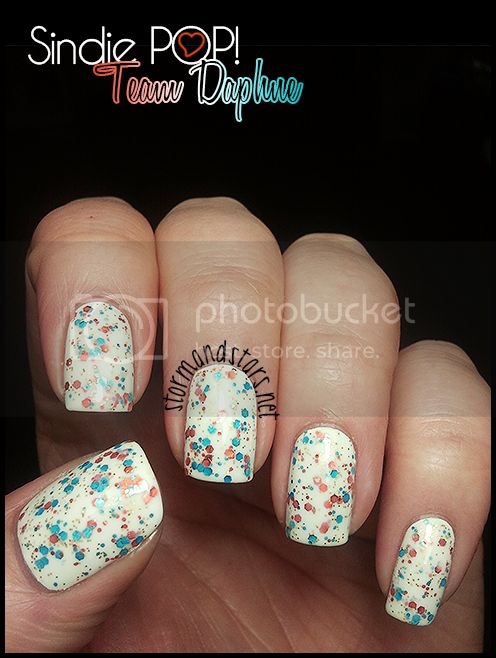 Team Daphne (love the name) is a milky white base with bright, bold teal and orange glitters filling it to the brim. I absolutely love this shade. I didn't want to take it off when I had it on and if it hadn't been the first one I swatched I'd have probably left it on. 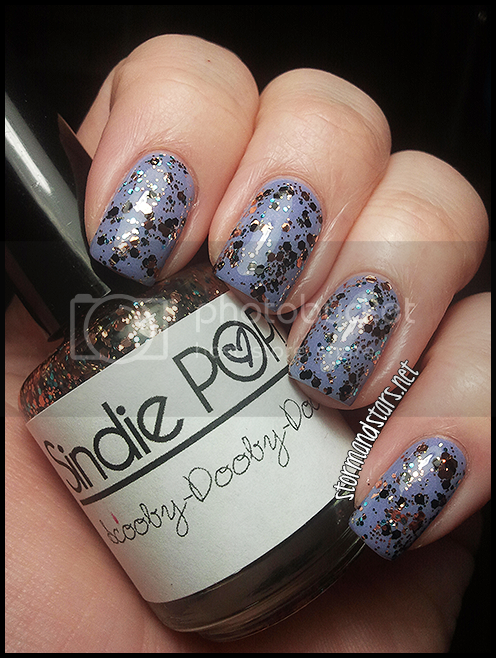 I started out with two coats of Cult Nails Tempest as a base and then did just one coat of Team Daphne over the top. 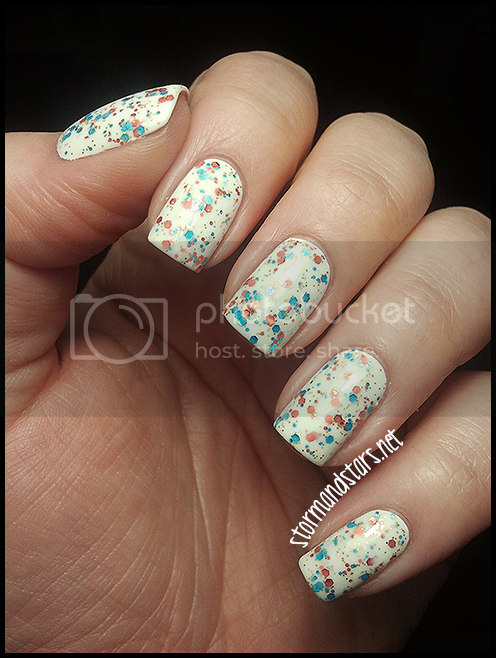 Great formula, not goopy at all like some milky bases can be and the glitter payoff is fantastic for just one coat and I love how the white base brightens the milky base of the polish. Time for Daphne! I had a hard time figuring out what to layer this one over, but once I found it Danger Prone Daphne really came out to shine. 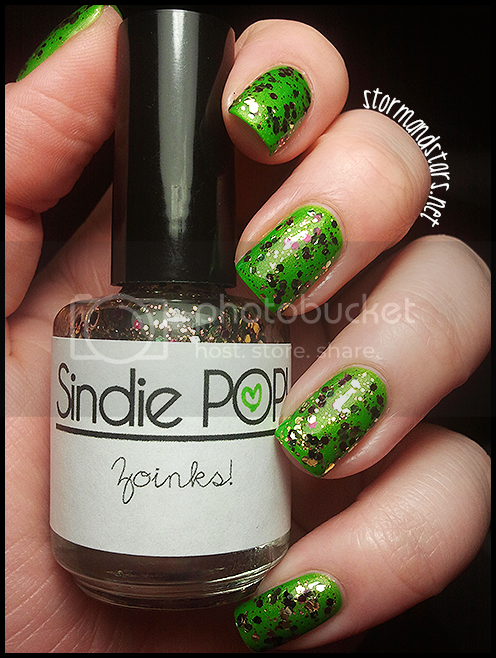 I layered one coat of Danger Prone Daphne over two coats of Cult Nails Manipulative for this gorgeous combo. Once again, fantastic formula and the attention to detail with the right colors in the right amounts to represent the characters. I couldn't ask for anything more with this one. The colors in this are so rich and shiny and gorgeous. Golds and coppers and this deep purpley maroon color. Yum! 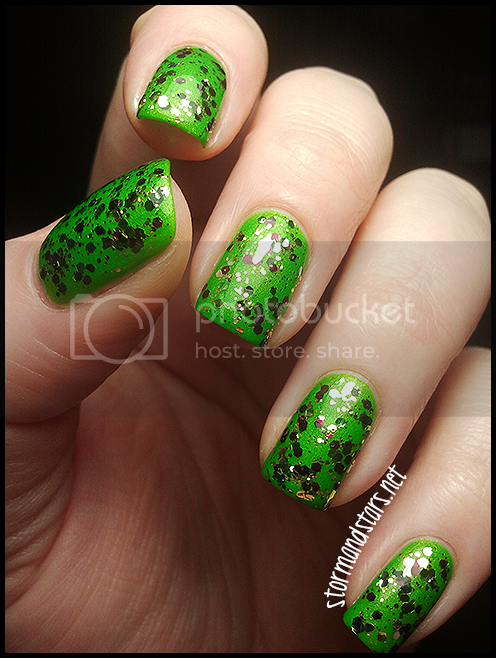 I started off with three coats of Cult Nails Deal With It, which may very well be my favorite shade of 2012. I already need another bottle. On top I layered just one coat of Zoinks! Its too pretty for words. Just wonderful. If I had to choose I would say that Team Daphne and Zoinks are my must haves, but I really love them all. 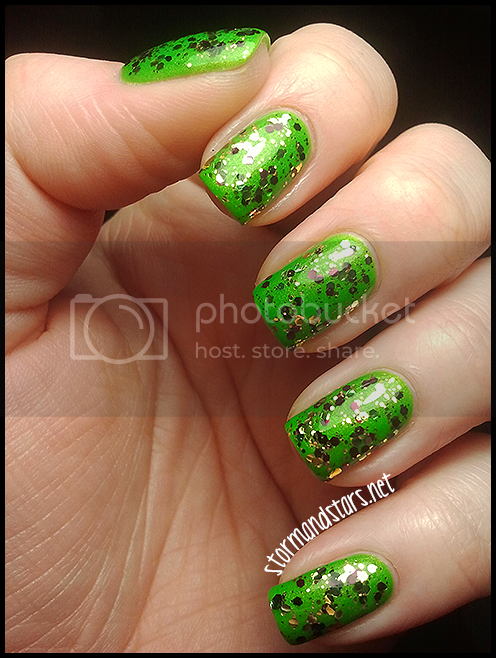 Overall, the attention to detail in all of Jessica's polishes is fantastic. 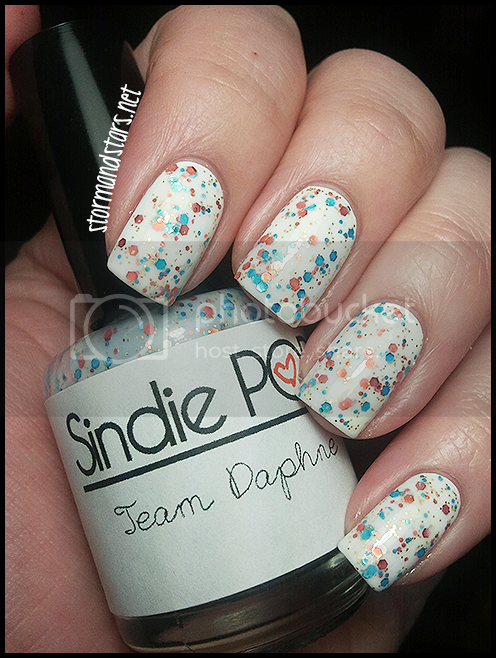 From the perfectly printed labels with the hand drawn hearts in the O on POP to the perfect colors chosen, Sindie POP! was a joy to swatch and review. How did you like the Scooby Doo! collection? Are you going to get one? Two? All? All these shades go on sale TODAY at 12PM PST at Sindie POP! 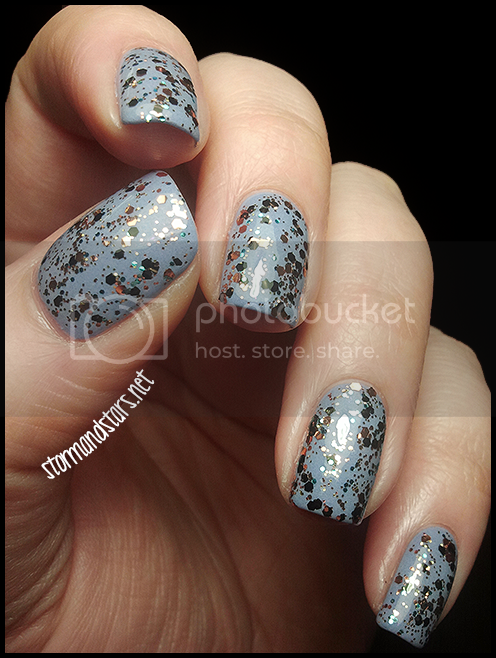 Lacquer Don't miss out!! These shades are Limited Edition, when they are gone, they are gone for good! Happy Birthday Cupcake Glitter Daze!